I have had pain and tension in my neck and shoulders for several months. It hurt to turn to the right and the left. I love doing Zumba a couple of times a week and Pilates classes. I have been working with Jennifer at Serenity Pilates on specific exercises that release the pain and tension in my neck and shoulders for the past 6 weeks and the pain is finally working itself out. We work on pulling and pushing exercises that move the scapula (shoulder blades) and that loosen and strengthen the muscles of the upper and middle back. As we go through a series of pulls and pushes I turn my head evenly to each side so that I can stretch the muscles on either side of the neck creating a better length/ tension balance there. 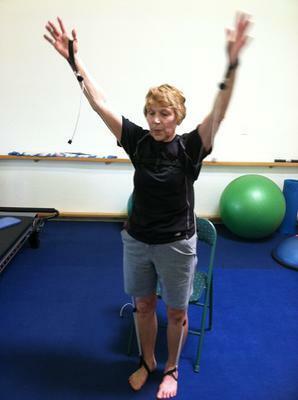 Jennifer describes these band exercises in her Shoulder Ebook in great detail about how to treat and prevent shoulder and neck injuries. 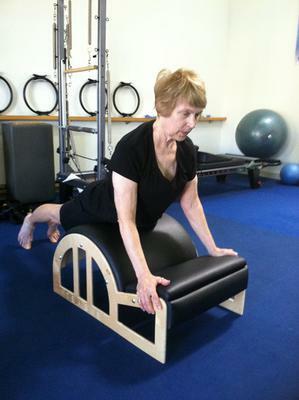 We work on shoulder stabilization by doing exercises such as the cobra/push up version as shown here on the spine corrector. This exercise is very useful as it opens the chest, as you can see, and it helps to stretch the muscles of the neck. At the top of this stretch is where I like to turn my head evenly to the sides to be able to work out the neck tension. This exercise can be duplicated on a flat surface as well, it's just much more comfortable doing it on a padded raised surface. Swimming exercises on the mat or a raised surface are also helpful for strengthening the upper and middle back while working on correct posture and lengthening up through the back of the head and shoulders. Jennifer has developed a wonderful resource for everyone with neck and shoulder pain and tension, as well as for those suffering with other shoulder injuries. Her Shoulder Ebook is a wealth of information on exercises and exact descriptions of how and what to do for specific shoulder injuries and pains. I would highly recommend using her expertise to help you get out of the pain that you have been experiencing from your neck and shoulder. There are many pages available on this site that will show you exercises related to specific shoulder conditions such as the rotator cuff, impingements, tendonitis, shoulder and neck myalgia or pain and weakness. Find more ways to treat your neck and shoulder pain here.